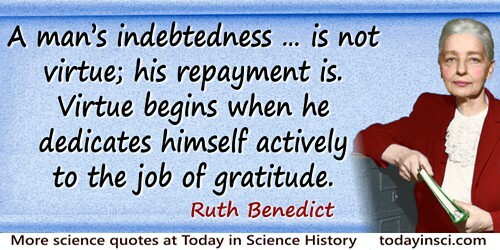 A man’s indebtedness … is not virtue; his repayment is. Virtue begins when he dedicates himself actively to the job of gratitude. In The Chrysanthemum and the Sword (1946, 2006), 114. As quoted in Martin Childs, 'Professor Joseph Murray: Surgeon who performed the first successful kidney transplant', Independent (28 Nov 2012).